Home to 1,500 guest rooms ranging from affordable rooms that provide simple comfort to luxurious suites, Hotel Boss caters to anyone from couples on a budget to tourists looking for a lavish stay. Their standard double room will set you back by S$104 per night. Lounge at their gorgeous sky terrace, take a swim at the outdoor swimming pool or sweat it out at their gym, whichever you fancy! 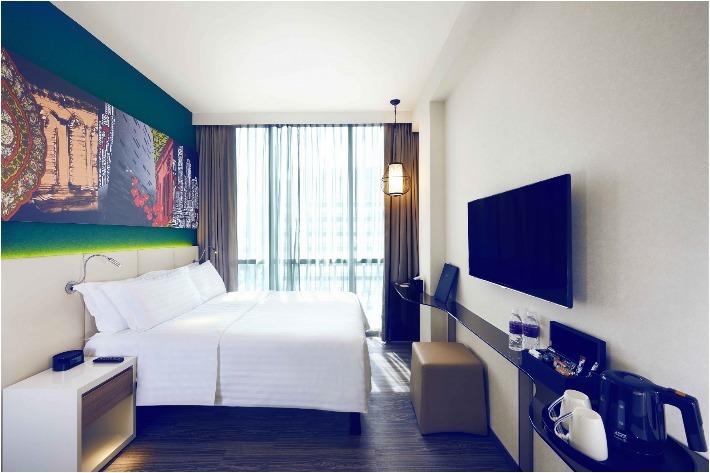 Conveniently nestled close to the town area of Dhoby Ghaut, Hotel G is quite possibly the best deal you can get if you are looking for somewhere that is affordable, comfortable and within walking distance to the hustle and bustle of Singapore. Priced at S$155 per night for a Good King Room, Hotel G leaves little to wonder as to why it is popular among both tourists and locals alike. As its name suggests, Hotel Mono is decked out in minimalistic monochrome furnishings. Besides a totally black and white exterior, expect each and every room to be filled with just aesthetically-pleasing, simple and furniture with utterly clean lines. Hotel Mono is home to 46 rooms each with sleek designs and prices start from just S$133 per night for a double room. A relatively new boutique hotel, Hotel NuVe Urbane sits within walking distance of Lavender MRT, Farrer Park MRT, Nicoll Highway MRT as well as Bugis MRT. Fully equipped with WiFi, a complimentary minibar, a small swimming pool and a restaurant on the first level, this hole-in-the-wall boutique hotel is truly a hidden gem. Prices start from just S$133 per night for a double room! Situated just a 2-minute walk away from Bugis MRT, Mercure Singapore Bugis is quite possibly one of the most affordably-priced 4-star hotels in town. Surrounded by historic monuments, street markets and shopping malls, this hotel screams convenience at its finest and is surely suitable for both tourists and locals looking for a quick getaway. A stay in the Signature Room with Queen Bed will set you back by just S$150 a night. Fully equipped with an infinity pool, lap pool, tennis court, 24-hour gym, and 7 dining outlets including Winestone and Food Exchange, Novotel Singapore on Stevens is one gorgeous hotel whose architecture has won themselves the Gold prize in the 2018 Melbourne Design Awards. Prices start from just S$160 per night for a Deluxe room so take bae here if you’re looking to impress without your wallet taking a beating! Located right in the heart of Bukit Timah, Pegasus Boutique Hotel is set in one of Singapore’s iconic heritage buildings. Nestled amidst lush greenery, this boutique hotel is ideal for a respite from city life—all without having to break the bank. This budget-friendly hotel is priced affordably at S$100 a night. If you’re lucky, you may even get to see monkeys wandering in the vicinity! Also relatively new, The Great Madras is a retro-themed boutique hotel nestled in the heart of Little India. Quirky neon lights tastefully adorn the pastel coloured walls and most of their rooms such that you’d feel as if you’re starring in a 1950s film right from the get-go. They offer 8 different types of rooms ranging from shared hostels to an entire suite to yourself. Prices start from S$186 per night. Looking for a hotel that is quirky in all the right ways? XY Hotel Bugis dubs themselves as an artistic and tech-centric hotel in Singapore, each and every room here is hand-painted and designed by an artist. Expect to find gorgeous murals on your walls such as one of a Tiger beer bottle! One night stay in a deluxe room will set you back by S$155++. If you are the type who values time and efficiency, you’d be glad to hear that Yotel is on the same page as you are. Possibly one of the most hi-tech hotels around, Yotel is a dream come true for tech-savvy travellers as they offer an entirely new staycation experience. 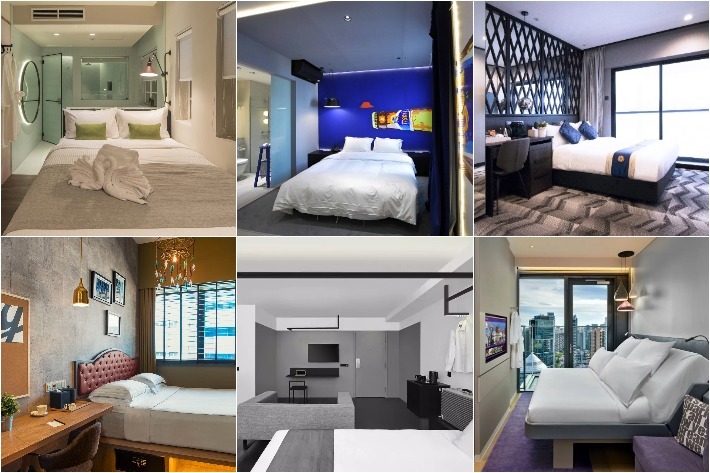 With prices starting from S$230 per night for a Premium Queen Room, Yotel may be the most expensive of the lot but it definitely is worth it considering that it is located along Orchard.